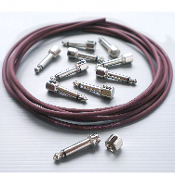 Evidence Audio SIS2 Solderless Cable Kit for Guitar Pedals. The Monorail cable is true to the voicing priorities of Evidence Audio in a form factor which allows you to get great sound in small spaces. Strand interaction is mitigated with the same 20 awg IGL conductor used in the Lyric, Siren and Melody cables. The Monorail can be soldered with a variety of phone plugs, or used with the SIS Screw In Solderless plugs.Evidence Audio introduces the perfect 1/4″ Phone plug for use with its award-winning Monorail signal cable. As used by David Gilmour, Noel Gallagher, Ed O’Brien of Radiohead, Guthrie Govan, Andy Timmons, Guy Pratt, Steven Rothery, and many others. No signal failures in the middle of a song anymore! Visit the instructions page or view the gallery for more information. Free shipping in the UK, £7.99 shipping fee apllies to all locations outside of UK and will be invoiced seperately.